It was a good story and a worthy quest. Which will continue. The Clotilda is believed to be the last slave ship reach the U.S. and after unloading its illegal cargo of slaves -The importation of slaves had been illegal since 1808)- it was burned and sunk. The captured African went on to found Africatown, near Mobile. This one is a keeper. For those of us who like to explore Alabama, it's often tough to know where to eat in unfamiliar territory. I've used the Alabama Tourism Office's 100 Dishes publication and website, which is helpful, as is their 100 Dishes app. But now, here's something else to add to your arsenal. Al.com has just put together a list of The best restaurant in every county in Alabama | AL.com. Sure, they had to leave a lot of great places off. But a list like this can narrow the choices when you're hungry. The Black Warrior Waterdog (or Alabama Mudpuppy) is found only in Alabama and nowhere else in the world. 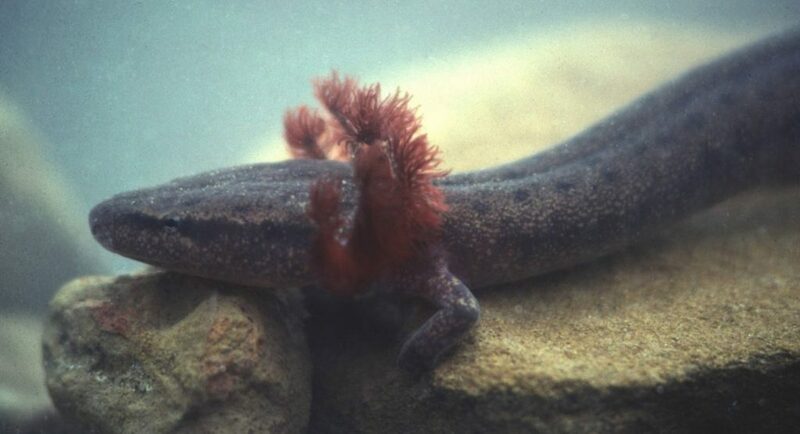 The large, aquatic, nocturnal salamander permanently retains a larval form and external gills throughout its life. It can grow to 9 1/2 inches in length. And this unique creature needs protection. The U.S. Fish and Wildlife Service (FWS) has now listed the salamander as an endangered species, meaning it is in danger of extinction. The Black Warrior Riverkeeper is helping champion its protection. 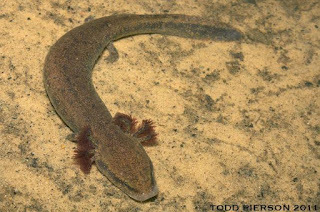 Low and declining population numbers Due to loss and fragmentation of its habitat and poor water quality in the Black Warrior River Basin, mudpuppy populations are low and declining. The salamander's highly permeable skin and external gills make it particularly sensitive to declines in water quality and oxygen concentration. Conserving water to allow more water to remain in streams. Using pesticides responsibly (especially around streams and lakes) to prevent runoff. Controlling soil erosion by planting trees and plants to avoid runoff of sediments into freshwater areas. Help your family find ways to reduce the amount of chemicals that you pour down the drain in your home or use on your lawn or garden. Support conservation efforts that protect these unique animals and the habitats they live in. Learn more about how the destruction of habitat leads to loss of endangered and threatened species and our nation’s plant and animal diversity. Discuss with others what you have learned. Support local and state initiatives for watershed and water quality protection and improvement. Learn more about best management practices for keeping sediments out of streams. My old friend and colleague Joe Songer at al.com has put together a list of outdoor adventures in each of Alabama's 67 counties. With the temperatures dropping and the outdoors beckoning, it's nice to be reminded of all the great opportunities available in a short distance of home. This past weekend, I ventured with my son James and Boy Scout Troop 97 to Little River Canyon National Preserve and saw a great show. 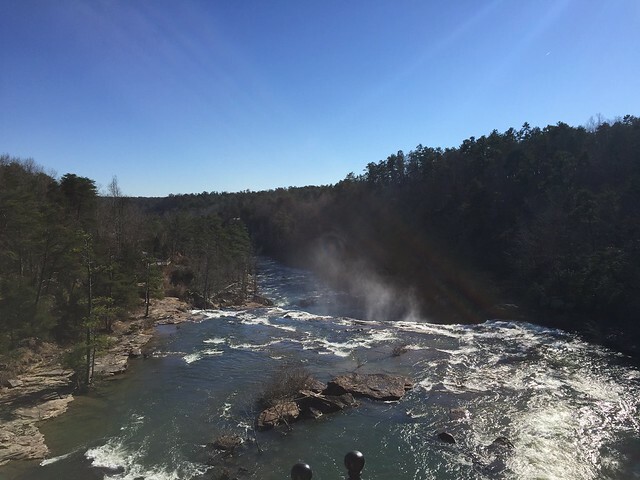 Thanks to heavy rains the previous week, Little River was running at full force, and the conditions drew kayakers from Alabama and surrounding states. The most intrepid of them plunged over the Falls, a 45-foot drop. My Flickr album includes video of this amazing sight. More information on Little River National Preserve is included in my book, Five Star Trails: Birmingham and on the Preserve's U.S. Park Service website. If you go, you must stop at the Canyon welcome center on Alabama 35 atop Lookout Mountain, just east of Fort Payne. The center, built by Jacksonville State University, serves as headquarters for the National Park Service staff and offers information and interpretation of the Canyon, which is one of the deepest gorges East of the Mississippi River and is nicknamed the Grand Canyon of the East. There is an easily accessible view of the Falls right off Alabama 35 and a hiking trail from that parking lot to a smaller set of falls downstream, Martha's Falls. You can also get spectacular views by driving the twisty road the follows the Canyon rim. Other hiking opportunities along the way.